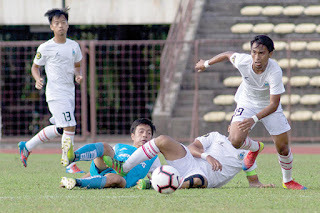 KOTA KINABALU: The Sabah President Cup squad finally claimed their first win of the season with a 2-0 victory over Penang at Likas Stadium on Monday. The Under-21 team who had lost their opening two matches 1-0 to both Pahang and UiTM, was in control of the game right from the start. However, it took them another 20 minutes before Faizul Nizam Aziz opened the account when he beat the Penang goalkeeper from close range with a low shot after receiving a cross from Zulkifly Harun. Despite their dominance, they were unable to add more goals due to poor finishing. The second goal only came in the 61st minute courtesy of Shariman Mukarim, who repaid the faith to start him for the first time this season by beating the opposite keeper in a one-on-one situation after a pass from Syukri Baharun. The visitors finished the match much stronger and Sabah also had goalkeeper Joslan Aping to thank for as he made several saves to keep the team’s first clean sheet of the season. Coach Justin Ganai was pleased with the win after the game and reckoned there is still room for improvement. “It was a good result and the boys played well. They are more organised now and it is good to see that they are getting better in each match. “However, they need to improve their ability to keep possession. They tend to lose the ball easily and this has caused immense pressure to the back and hopefully this three-week break, we can work on that aspect,” he said. The team’s next match is against AFFC on March 30 here at Likas Stadium.